March 2019 | Attorneys' Title Guaranty Fund, Inc. Some content is password-protected for ATG member agents only. Not an ATG agent? Apply today! The threat is real, attempts on agents' accounts are frequent. All of us in the financial services industry must be vigilant about the ever-increasing threat of fraud and implement processes to minimize the risk of being victimized. Attorney agents: Please download our flyer, Don't Fall Victim to Wire Fraud Schemes. Review it with your associates and staff and make sure your practices are in compliance. Take special note of Item 2: "...a party should never use contact information supplied in an email they receive for confirmation, including wire instructions for transmitting funds to the closing agent and for making payoffs of mortgage loans." Also, see our flyer for consumers, Wire Fraud Alert. Attorney agents and real estate professionals, please feel free to print and distribute it to clients. Click the image below to access the PDFs. Questions? Contact us. 4/6: Navigating a Wisconsin Real Estate Transaction | Learn the basics and more from experienced attorneys. ATG Sponsors The Thornes at IBF Lawyers Rock Fundraiser | Lawyer-led bands perform to raise funds for Illinois Bar Foundation's M. Denny Hassakis Fund. Discounted Parking | Use Washington and Franklin Self-Park for your Chicago Loop closing and save. 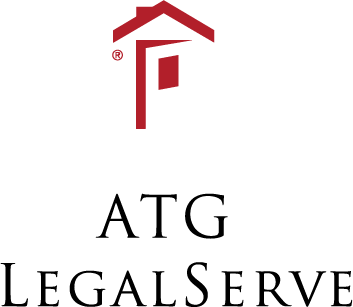 Follow ATG on LinkedIn | Keep up with news and views. Social Media 101: Social Media Basics | April 3 | OnLine | 1.50 MCLE in Illinois; 1.50 CLE applied for in Wisconsin | Back by popular demand: Learn how to better connect with your audience on Facebook and LinkedIn and achieve your business goals from social media expert Sue Koch. Who Should Attend: ATG agents; real estate attorneys; support staff. Details/Register Now (account required). See the full ATG Legal Education calendar. What Is ATG Trust Company? — ATG Trust is an independent trust company established in 1998 with a mission to provide creative, collaborative, and committed trust and estate administration to advisors and their clients. See our brochure for a list of services and answers to frequently asked questions. Visit our website to learn more about us. Feel free to contact a trust associate if you have questions. FAST AND FLEXIBLE: The Process Server Responsive to Your Needs — Explore our new website and learn about the difference we can make in your practice. Place your order today!